Made of a sturdy and lightweight support system, compatible with different lens adapters from Sony, Canon, RED, Panasonic, Blackmagic, ARRI and many other camera models with interchangeable lenses. The REVOLT vct universal baseplate combined with the SHAPE DOUBLE BLACK HANDLE ARRI ROSETTE. 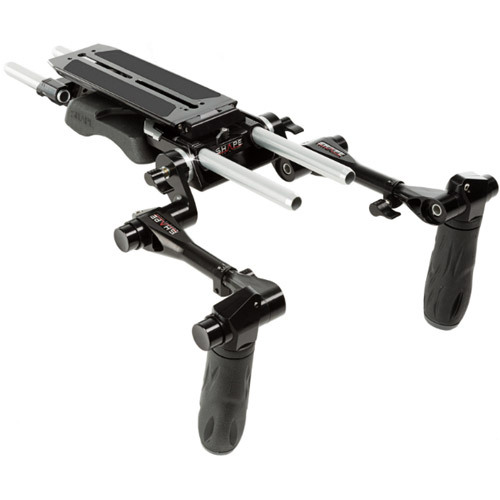 Front to Back Sliding Plate providing you with a quick positioning of your camera accessories for an optimal adjustment of your camera’s balance center. Easy adjustment of the rod bloc height to match the optical center of your camera. Front and rear rod blocs can be fixed to the baseplate allowing you to install more accessories. Integration of sophisticated tool box for a quick access to your Allen Key and extra screws. Safety Pins and Ratchet knobs to prevent the plate from sliding, to secure the rods and to increase the strength of your rig.